Made in Japan from quality ceramic, this Japanese saki set features a modern design with chrysanthemum pattern all along the sake jug and sake cups. This sake set comes with a set of four cups so you can invite friends and family over to enjoy several jugs of nice and warm sake on a cold winter night. This Japanese saki set features a unique shape and design as a whole, the jug holds a rectangular shape and the cups hold a circular one. When looking at the sake jug you would notice the nice rectangular box-like shape and the part where you pour holds a circular shape that protrudes outwards. The color of the sake jug is metallic grey with black speckles all around. The design on the sake jug features a white strip rhombus pattern of blue chrysanthemums in each section. Chrysanthemum are well known in Japanese culture because it symbolizes long life and superior character. The strip of rhombus pattern runs along the front of the sake jug sideways going around the left and right side. The back of the sake jug also holds the strip pattern but as a single strip. The sake cups features the single rhombus strip pattern with the same metallic grey and black speckles all over, whereas the inside of the cup is white. The texture of the sake set is smooth with tiny bumps for the metallic grey part and the strip pattern holds a more sandpaper-like texture. 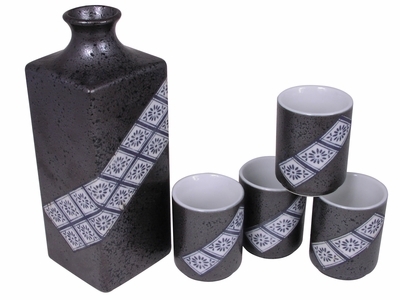 This sake set is very unique with it's two different shapes and the color it holds, giving it a modernized look to it. Bring this unique Japanese saki set home and enjoy a nice warm or cold cup of sake with friends and family. Already comes packaged in a box for easy gift wrapping, you can make this as a present to give to your sake-loving friends.